Born of a private collector's passion, the museum is just a few steps away from the Cenisio stop on Milan's appropriately named n. 5 lilac line (in case that reference was too obscure for you, how about Chanel n. 5 and the profume of flowers?). When you get to the address, don't let the unassuming apartment building fool you; it's in a small semi-basement apartment brightened with lights and lots of large clean glass cases housing hundreds and hundreds of examples. 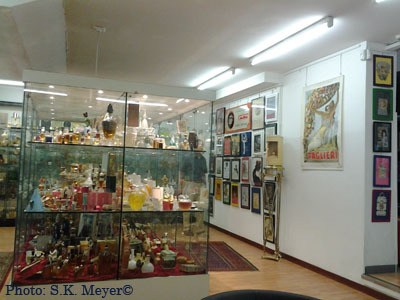 No labels, though, but the visits are obligatorily guided, anyway, by the enthusiastic collector and founder, so you won't miss them. Two basic threads seemed to interweave, separate and weave, again: the changing fashions of both smell and packaging (and, hence, marketing...OK that makes three threads). 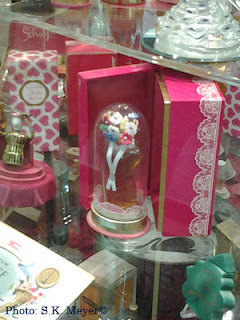 Though perfumes are known to us from just about the beginning of history (i.e., writing, about 3300 BC), the collection concentrates on the period from the late 19th century, when perfumes for ladies -- as far as I can remember of all the info I was trying to absorb -- tended to be of single flowers, pure in their idealized asexual view of women, up to the roaring Twenties, when the social life of ladies burst out of more than corsets, embracing the birth of sensual complex fragrances, up to our own time. 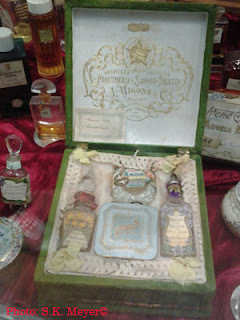 Similarly, perfumes originally were produced, like medicines, by neighborhood pharmacists, and so were packaged anonymously in the same anonymous rectangular bottles also used for medicines. In the early 20th century, the need to attract attention in the ever industrially expanding universe of perfumes also provided fertile ground for the birth and development of creative bottle designs. My personal favorite? This one for Chanel, created by a stroke of genius and the designer's sneak peak at the tailor's bust Mae West sent to Chanel for the creation of her clothes.